FACT: When horns from woolly rhinos were found in Russia during the 19th century, many believed they were the claws of giant birds, because they were found apart from the rest of the body. The woolly rhinoceros (Coelodonta antiquitatis) is an extinct species of rhinocerosthat was common throughout Europe and northern Asia during the Pleistoceneepoch and survived the last glacial period. The genus name Coelodonta means “cavity tooth”. The woolly rhinoceros was a member of the Pleistocene megafauna. The appearance of woolly rhinos is known from mummified individuals from Siberia as well as cave paintings. An adult woolly rhinoceros was typically around 3 to 3.8 metres (9.8 to 12.5 ft) in length, with an estimated weight of around 1,800–2,700 kg (4,000–6,000 lb) or 2,000 kg (4,400 lb). 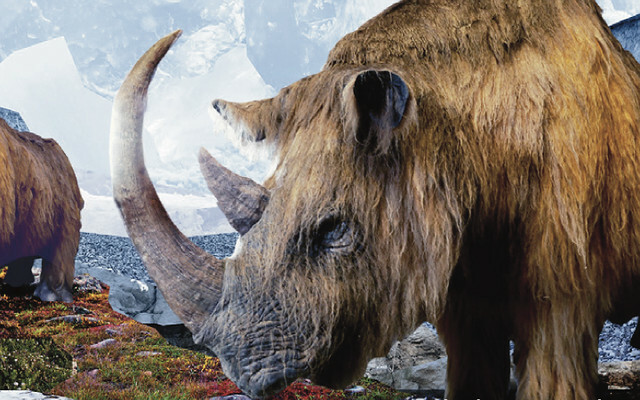 The woolly rhinoceros could grow to be 2 m (6.6 ft) tall; the body size was thus comparable to, or slightly larger than, the extant white rhinoceros. Two horns on the skull were made of keratin, the anterior horn being 61 cm (24 in) in length, with a smaller horn between its eyes. It had thick, long fur, small ears, short, thick legs, and a stocky body. Cave paintings suggest a wide dark band between the front and hind legs, but the feature is not universal, and the identification of pictured rhinoceroses as woolly rhinoceros is uncertain. Its shape was known only from prehistoric cave drawings until a completely preserved specimen (missing only the fur and hooves) was discovered in a tar pit in Starunia, Poland. The specimen, an adult female, is now on display in the Polish Academy of Sciences‘ Museum of Natural History in Kraków. Several frozen specimens have also been found in Siberia, the latest in 2015.